Hello and welcome to the first Issue of the KCTS Resource for 2010. This year we’ll be producing the Resource on a bi-monthly rota. In-between issues we’ll also be sending out a newsletter once a month with snippets of our recent blog posts, just in case there are any previous postings that may interest you. In this March edition we’ll be looking at why factories fail to benefit from Loss Measurement; we’ll be talking about the number of reasons why this is so, in order to give you a clear insight into this methodology. We also provide a feature on Failure Modes and Effects Analysis (FMEA) and how the purpose of this tool is to take actions to eliminate or reduce failures, starting with the highest-priority ones. 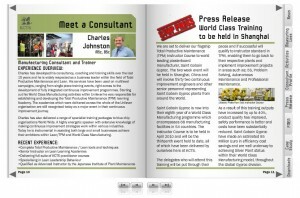 In addition to the above we’ve also got our regular features including; Meet a Consultant – introducing our Managing Director, Charles Johnston; a Case Study on SMED, focussing on an injection moulding machine; some Lean/TPM puzzles to test your knowledge and don’t miss the press release about our high level TPM Instructor course and World class training being held in Shanghai. In our free downloads section we’ll be sticking with the SMED theme and offering you a A0 SMED activity board, as well as the opportunity to download a EWO (Enhanced Work Order) worksheet. We’ll also show you how to use it with a ‘How to Do’ EWO sheet, not bad for free! This entry was posted on Tuesday, March 9th, 2010 at 16:43	and is filed under KCTS Resource. You can follow any responses to this entry through the RSS 2.0 feed. You can leave a response, or trackback from your own site.